Designed by Cynthia Guggemos, each of these three sets of cardigans, blankets, and bonnet or cap is richly textured and knitted of soft, light weight yarn. 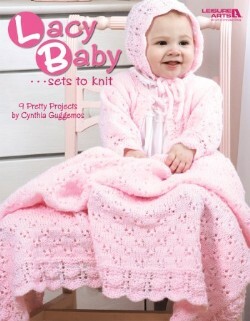 Choose from Kitten, Garland, and Blossom patterns in sizes 3, 6, or 12 months. Leaflet - 28 pages by Leisure Arts.